Migos had a chat with Ebro on his Beats 1 Radio show, and one the things they talked about was Joe Budden. Of course, Budden and the Atlanta trio have been going back and forth since they had that infamous confrontation at the BET Awards. During their conversation, Migos joked about being responsible for giving the retired rapper a new job with Diddy's RevoltTV, since his prile did go up after the video that skirmish surfaced. The group also said they want a percentage Joe's paycheck as compensation. Afterward, Takef said the group actually wants to see Joe win but he doesn't want the same for them. But Offset didn't agree with that statement and said Joe's criticism comes from his passion for Hip-Hop. 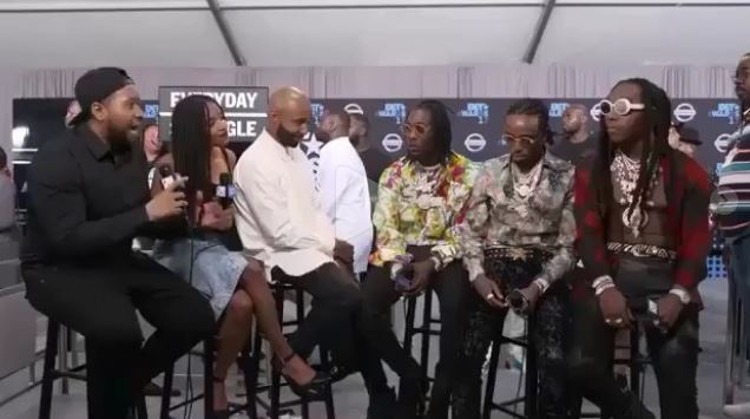 Quavo agreed with Offset that Joe's passion fuels his harsh remarks towards them, and he also said the group has no beef with him. Do you agree with Offset's comments about Joe criticising them because his passion for Hip-Hop? Furthermore, can a person be into Hip-Hop too much? Does such a thing even exist?